Salif Keita - La Différence | Soul Kitchen Session from Soul Kitchen on Vimeo. This CD will be sold to benefit a charitable foundation designed to help Malians albino and facilitate the fight against discrimination against them. "Salif Keita said that this album is dedicated to albinos. The title "The difference" is significant. Composed of a dozen tracks with some of previously recorded songs, there are four new titles including the title track "The Difference "
Salif wanted to do two albums at the same time, but due to lack of time, and on the advice of the staff, he preferred to make this first album to help albinos." "The Difference" is about albinos. According to Salif, you can say someone's name without naming him, "It is also about me. We pay tribute to the albino, for their courage, their pain and other injustices, they are often victims. Although the phenomenon has now declined there are still cases. But the song "difference" is for them and is for us all. " The three singles that are new talk about everyday life and social issues. The other songs are old and are beautiful Salif songs from his time or his playing with Ambassadors Railband before his exile in Cote d'Ivoire. "At the request of music lovers, relatives and friends, I have these pieces to make them happy, but be aware that this is not just for this small circle that I did this. But for everyone because I am an artist. " The words of this album perfectly reflect the ideas. And what the singer wants to make the songs understandable for albinos with lyrics in Mandinka and Bambara. They call to joy, love and evoke the pleasures and benefits of life. "Happiness is not for tomorrow, not hypothetical, it starts here and now. Let us not be dominated by violence, selfishness, despair. Do not sacrifice to the cult of pessimism. Let's rise up . Nature has given us special gifts. Nothing is played out for our continent. Nothing is lost yet. Let's take advantage of her marvels. Cleverly, in our case, our pace, and responsible men proud of their inheritance. 's build the land of our children and stop us feeling sorry for ourselves. Africa is also the joy of living optimism, beauty, elegance, grace, poetry, softness, the sun and nature. Let's Be happy to be sons and fight together to build our happiness. It is in November that "The Difference" will be on the Malian market and for this, Salif Keita asked everyone to buy this album to help albino children in their fight everyday. "I appeal to music lovers, to all those who love music do not pirate/bootleg this album. I have done this to help albinos. The funds will be used only for that really. It is my wish. Tell them not to pirate this album. " am I providing value for the visitor? do I focus on the visitor or on me making money? 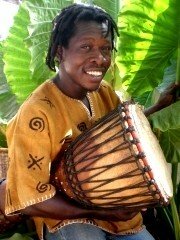 In my interview with Mustapha, he reveals what Master Drummers really are, and what it takes to become one.